Manchester City moved to the top of Group Two North in the Continental Tyres Cup with a 2-1 win over Everton. The visitors looked to have snatched a draw after Simone Magill cancelled out Izzy Christiansen’s opener but Nikita Parris popped up with the winning goal to continue City’s 100% record. It took a stunning save from Kirsty Levell to prevent City from taking an early lead as she tipped Parris’ close range effort around the post. Parris had the ball in the net less than five minutes later but it was ruled out for offside, despite protests that she had received the ball from an Everton player. But they did not have to wait long for a breakthrough as Steph Houghton’s floated ball over the top of the defence found Christiansen who headed into the bottom corner. Parris was inches away from doubling the reigning champions’ advantage as her effort from the edge of the box skimmed the crossbar. Levell was called into action again with 20 minutes remaining as she impressively stopped Jennifer Beattie’s header. Everton equalised with their first real chance of the game as Magill nodded in from Chloe Kelly’s free kick with 14 minutes to play. Jill Scott was denied an immediate response as she missed her header from six yards out after some great work from Demi Stokes. Parris then put City back in front just four minutes after being pegged back, glancing in from Scott’s initial header. Substitute Megan Campbell nearly made it 3-1 late on but her volley was cleared off the line. “I think we were very professional and we moved the ball well. At times, we were perhaps a little bit sloppy and a bit slow. We were very pleased with how we played. "We conceded a sloppy goal from a set piece and then obviously got back into the game and got the winner. We’re pleased to get the win. “I got a little bit at half time from the analyst who’d watch it [the goal] back and said it was a flop not a diving header. But I don’t care, it came off my head and it went in. “I’d like to think I’m a very fit individual and I work very hard on my performance. I’m ready whenever the manager needs me. "It’s just about making sure I’m professional 24/7 and being ready for the team when called upon. We’ve got a great togetherness in our team. We’re an exciting group of individuals who love playing with each other and love playing for each other." “We’re delighted with the performance, particularly in the second half. In the first half, City showed their class. “They’re a top team, there’s no doubt about that and I’ve got huge respect for the way they go about playing their football. “They’re rightly at the top of the Women’s game in England and they’re proving it in Europe. We’ve played them twice now. We lost narrowly 3-2 when we probably should’ve drawn and we were in a position of drawing again. “The shot counts is probably in City’s favour but we were competing with them. I don’t think any team has had a harder week in terms of fixtures – Arsenal, Birmingham and City. 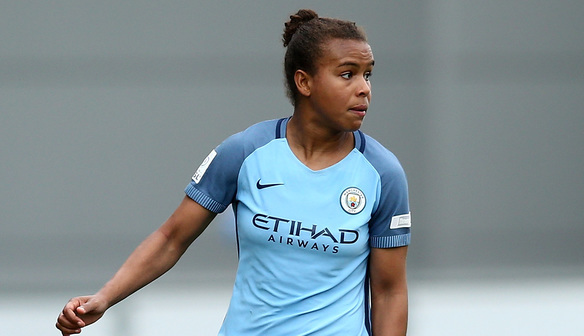 Manchester City (4-3-3): Karen Bardsley; Abbie McManus, Steph Houghton, Jennifer Beattie, Demi Stokes; Jill Scott, Keira Walsh, Izzy Christiansen; Nikita Parris, Georgia Stanway, Claire Emslie. Substitutes: Melissa Lawley for Stanway 74, Megan Campbell for Emslie 80. Substitutes not used: Marie Hourihan, Mie Jans, Esme Morgan, Jane Ross, Ella Toone. Everton (4-2-3-1): Kirsty Levell; Chantelle Boye-Hlorkah, Georgia Brougham, Gabrielle George, Danielle Turner; Angharad James, Megan Finnigan; Claudia Walker, Simone Magill, Siri Worm; Courtney Sweetman-Kirk. Substitutes: Chloe Kelly for Worm 53, Faye Bryson for Boye-Hlorkah 65, Olivia Chance for Sweetman-Kirk 69. Substitutes not used: Jodie Brett, Lizzie Durack, Marthe Munsterman.